I am heartened to see that others have many 'to do' or in progress quilts. It makes me feel a whole lot better about mine, since I'm pretty sure the number is still a single figure (though I haven't actually listed them for a while so I can stay in ignorance about them). This is one I've been working on for a few months in between others. I could hardly believe when I looked at the photo, how my Jack Russel cross dog, Abby, had snuck herself in posing and all! What is it with quilts and animals? In the photo her eye looks a little odd, so I checked it out, but it must have just been the light or something as she's fine. Also visible in the top left corner of the quilt is the typical empty spool of thread - yes, ran out with just 3 lines of the sashing to go. Here's the back which is a very calming cream, with all that riot of colour going on at the front I thought perhaps a quiet calm spot on the back might be the best idea. You can see I had begun those lines either side of the sashing and only got round once then one side the second line. Oh well, I guess I'll just have to go and visit my local quilt shop and try to avoid the temptations of fabric. 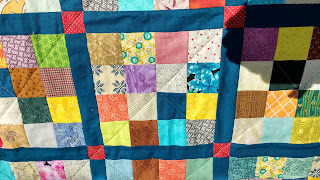 It's fun to use up scraps and squares can go together quite quickly. One of the fabrics in here I realised was left over from backing a quilt I made in 2001. Never throw any fabric away is my motto - it always comes in useful some time. Here's a close up of one of the blocks. 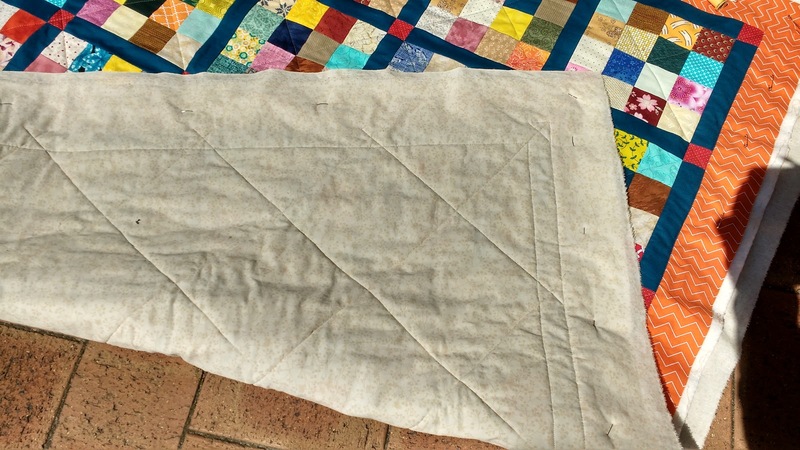 Well it's nearly there - just finish that sashing, put on some binding and its done. 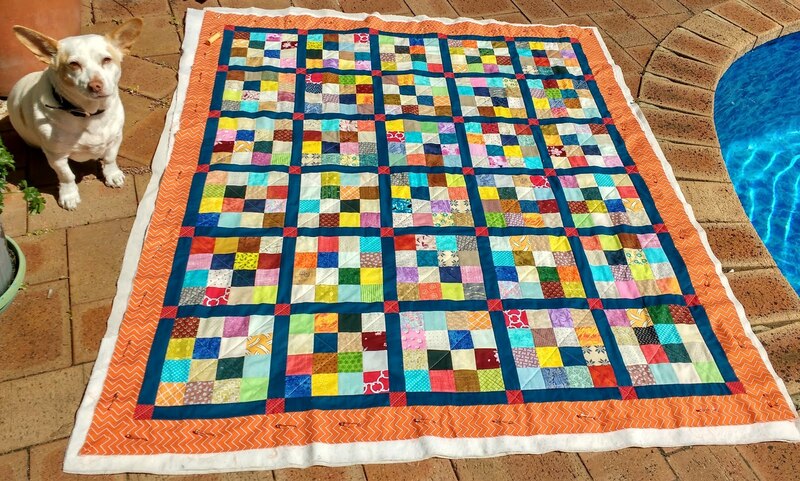 I think this may end up with my friend who passes quilts on to an organization placing foster children. Its nice and bright, so should suit the purpose well. Now, on to that reducing list, the never ending conundrum, which one to tackle next? Thread: Bobbin Superior; Top a variegated embroidery cotton. Bright, scrappy goodness! Were those 2.5" squares to start? I've been collecting that size and this is a nice way to use them up. 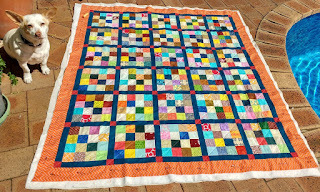 Colorful and Scrappy = Awesome!! !